Class will out, from horse and trainer. Solwhit's success in the Ladbrokes World Hurdle was his seventh Group 1 victory and, as only his third run in two years in a softly-softly campaign after leg problems, a testament to the skill of Charles Byrnes and his team at Ballingarry, Co Limerick. "We never lost faith in him," said Byrnes. "In the past he was one of the few horses who could put it up to Hurricane Fly. He developed a bit of heat in a leg, and though we tried to get him back for last season, we weren't happy with him, so we eased off and left it another year. We always believed he still had all his old ability, and today he's proved he hadn't lost it. "It's been a real team effort from all at the yard to get him back to this level and he has really come together in the last couple of weeks." The Ladbrokes World Hurdle was Solwhit's first try at as far as three miles. When his regular rider Davy Russell was claimed for Bog Warrior, Byrnes turned to Paul Carberry. As it turned out, Russell was ruled out of the race anyway on the day by a collapsed lung, and replaced by Bryan Cooper. "Desperate for Davy all round, because the horse is his ride," said Byrnes. "But Paul was the ideal deputy to help the horse get the trip. The horse settled beautifully for him and Paul was able to put him to sleep for most of the race and he rode exactly the way I wanted him to, with just the one to pick off at the last. "It's fantastic. I am relieved to be honest because a lot of the work has gone into him and Keith the head lad has looked after him so well. A big thank you to all the owners for staying with me. "He won an Aintree Hurdle and we have had some tremendous days with him. We knew he was coming back especially in the last couple of weeks and everything has come together." 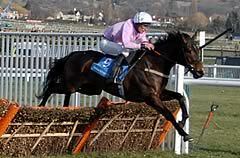 Solwhit, a French-bred nine-year-old by Solon, carries the colours of The Top Of The Hill Syndicate, a group of four from Wexford, whose social base is Gaynor's, a bar at the top of Hill Street in the town. The four members are Pat O'Hanlon, Hugh Martin, Thomas Power and the publican, Ger Gaynor. "Our man gave him a mighty ride," said O'Hanlon, his voice hoarse from shouting. "He's just the best there is." 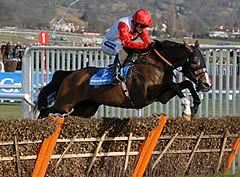 A super horse became a super-sub today when finishing a gallant and praiseworthy second in the Ladbrokes World Hurdle. Celestial Halo has been a grand operator for owner Andy Stewart and trainer Paul Nicholls, with a victory in the 2008 JCB Triumph Hurdle and a second and fourth in the following two Stan James Champion Hurdles, but he had not been asked to try the long-distance trip because of Big Buck's, his stablemate who carries the same colours. With that great champion unable to defend his crown today - Big Buck's would have been bidding for a fifth Ladbrokes World Hurdle, but for injury - Celestial Halo was sent into battle and ran a peach, cruising into the home straight under jockey Daryl Jacob, but succumbing to wilting stamina as the hill took its toll. A mistake at the final hurdle did not help and he finished second, beaten two and a half lengths by Solwhit, with Smad Place another three lengths behind in third. Nicholls said: "If Big Buck's hadn't been around he would have been running over this trip earlier - that was the only reason. He's given us a blinding run so I'm really pleased. "He's an amazing horse and does his bit every year. He got a leg here last year, so we fired him after that and I really haven't been able to do as much with him as I would like. I can get him fitter than this. "Daryl was really pleased with him, but said he was just running on empty going to the last. That mistake didn't help him, but he's not quite where I want him yet and he will improve. Now we'll go to Aintree and Punchestown, and with Big Buck's out until next spring this horse will continue running in these races. Aintree, being flat, might suit him best." Smad Place was third in this race last year, and trainer Alan King said: "I'm delighted because he's run a lovely race. He travelled and jumped well. I don't know what we'll do with him between now and the end of the season - Aintree is a possibility, because he's only had three runs this season - but he's going to make a lovely novice chaser." The Ladbrokes World Hurdle is one of the youngest races at The Festival. Known as the Stayers’ Hurdle up to and including 2004, it was only introduced with the current race conditions in 1972. Before that, the equivalent race was known as the Spa Hurdle. Foot and mouth caused abandonment in 2001. The Ladbrokes World Hurdle has been run on the Tuesday, Wednesday and Thursday of the meeting. It moved to its current Thursday slot in 1993. The first year of sponsorship was 1972, under the title of the Lloyds Bank Hurdle. There have been four sponsors of the race, with Lloyds followed by Waterford Crystal from 1978 to 1990 and Bonusprint from 1991 to 2004. The first year of Ladbrokes’ sponsorship was 2005 and prize money currently stands at a record £275,000. The most runners to have participated came to 22 in both 1985 and 1990. The current safety limit is 24. The smallest number of horses to line up was eight in 1973. Big Buck’s created history in 2012 when becoming the first four-time winner. He was also successful in 2009, 2010 and 2011, but injury has ruled him out of challenging in 2013. The only triple winner is Inglis Drever, the winner in 2005, 2007 and 2008. There have been three dual winners - Crimson Embers (1982 & 1986), Galmoy (1987 & 1988), and Baracouda (2002 & 2003). The Stewart Family, owner of four-time winner Big Buck’s, is the most successful owner. Paul Nicholls, victorious with Big Buck’s in 2009, 2010, 2011 and 2012, is the most successful trainer with four wins. Ruby Walsh, who partnered Big Buck’s to each of his four victories, is the winning-most jockey. Two mares have been successful - Rose Ravine (1985) and Shuil Ar Aghaidh (1993). The 40 runnings have seen 14 favourites achieve success (35 per cent). The biggest shock was provided by A Kinsman, who was a 50/1 chance when scoring in 1983. At the other end of the scale, Big Buck’s was the shortest-priced winner at 5/6 for his 2010 and 2012 victories. One grey has succeeded - Iris’s Gift in 2004. The youngest winners were the six-year-olds Big Buck’s (2009), My Way De Solzen (2006), Inglis Drever (2005), Bacchanal (2000), Cyborgo (1996), Dorans Pride (1995), Trapper John (1990), Rose Ravine (1985), Derring Rose (1981), Mountrivers (1980), Lighter (1979), Flame Gun (1978) and Town Ship (1977). The race was dominated in the mid-1980s by Crimson Embers, trained by Fulke Walwyn, and the winner in 1982 and 1986. Indeed, Crimson Embers would have been awarded the race in the stewards’ room in 1985 had his rider not declined to give evidence to the enquiry afterwards, but the trainer won the race anyway with Rose Ravine. The owner, Sally Smart, was ambivalent about the result - she owned both horses! Gaye Chance, the 1984 winner, was a full-brother to the 1983 Champion Hurdle winner Gaye Brief. Both horses were trained by Mercy Rimell. No horse has won both the Stan James Champion Hurdle and the Ladbrokes World Hurdle. The three-time winner Inglis Drever was partnered by different jockeys for each of his victories – Graham Lee (2005), Paddy Brennan (2007) and Denis O’Regan (2008).